UPPER WEST SIDE — If you take the word of some food critics, Upper West Siders are cleared out of restaurants and tucked into their beds by 9 p.m. While there are plenty of family-friendly eateries that close up shop by 10 p.m., the neighborhood also features places to satisfy night owls, or just those taking in a late movie or a concert at the Beacon. Take a look at DNAinfo's list of the best late-night eats on the Upper West Side. From a shrimp po'boy to a banh mi, French Roast is pretty inclusive in what it deems French on its 12 a.m. to 7 a.m. menu. Those looking for more classic fare can get a steak au poivre, mussels provencal or Croque Monsieur. There's also an array of breakfast options and rich crepes. If you want a cheap and filling option before hitting the sack and don't mind eating it standing up, Gray's Papaya is always a go-to. Beef hot dogs cost $1.95 with cheese or chili running an extra 50 cents. With breakfast served all day and all night, City Diner is a good bet for those wandering home from an all-night dance session, as well as those coming off a night shift or getting ready for an early one. At $10.50, the Lumberjack is a steal and comes with pancakes, two eggs, bacon, ham and sausage. If you want to whip up a homemade meal in the middle of the night, or simply have a hankering for a specific brand of chips or ice cream, West Side Market is the spot. It's open 24 hours and also has a pretty extensive beer selection. If you're looking for a pastrami sandwich or waffles as the night comes to a close, Viand is a good, quick option. From Thursday through Saturday, The Smith stays open later. Fill up on something more substantial, like a porterhouse steak for two, or stick to the bar snacks, like hot potato chips with blue cheese fondue. And don't forget to hit the photo booth downstairs to help you remember the night. This Australian bistro has a seafood-heavy late-night menu served at the bar until 1 a.m. Thursday through Saturday. Blue point oysters are $1 each and fried oysters are $4; there is a salmon rillette with rhubarb gastrique and a smoked salmon with ginger yogurt, both for $5. The restaurant also serves crab beignets with mayo and ginger and a salt code croquette with harissa aioli for $5 each. For non-seafood eaters, the risotto fritters and triple fried chips will do the trick. Hot dogs with tons of garnishes and sausages from abroad are the stars at this classic beer hall. But vegetarians and pescatarians can find options on the menu as well, including grilled Atlantic salmon or a Greek salad. The kitchen is open until 1 a.m. on weekends, but the bar stays open until 3 a.m. The Metro Diner is known as a place where people can relax. It's also a diner where you can get a BLT for $5.50 or a New York Central Egg Cream for $2.75. If you're extra hungry, you can order from the "Overtstuffed Sandwich Sensations" section. With a menu that goes on and on — including plenty of Greek and Italian favorites, as well as sandwiches, cakes and pies — there's surely something at this longtime diner to satisfy your late-night craving. On Fridays and Saturdays, this pizza joint stays open late. Classic slices — veggie, pepperoni and plain — are always available and can be heated up and boxed quickly, or devoured on site. Like many locals, the smell of Chirping Chicken may have wafted in your direction as you passed by, or a delivery person sparked your interest in the spot. Either way, don't worry about getting there early. The portions of salty, savory chicken are ample and there are other filling options like cheesesteak or ribs. How can you pass up "The Bird" — hot buffalo chicken, blue cheese dressing, scallions and jalapenos on a white pie — especially after a night out? Two Boots is open until 2 a.m. and also serves other inventive pie creations, including a vegan option. While this sports bar is known for its pub fare, there are healthier options, too, like the hummus plate and a variety of salads. Or you could just stick to their wings. Though the bar stays open until 4 a.m., the kitchen closes at 2 a.m. nightly. The Meatball Shop is all about comfort food, and its menu can be customized to fit your hunger level. Slightly peckish? Have a couple of meatball sliders. Ravenous? Go for a hero — three meatballs on a baguette with sauce and cheese. The restaurant is open until 2 a.m. Fridays and Saturdays, and until midnight Sunday. Spirits are the focus of Barley and Grain, which describes itself as "an American whiskey bar and restaurant." The eatery also features a fairly long menu of salads, seafood and meat entrees for between $10 and $23, as well as a smattering of snacks. The kitchen closes at 2 a.m. from Thursday through Saturday. If you're looking for bar snacks with just a touch more of an edge, the menu here fits the bill with dishes ranging from BBQ Bacon Bao Buns to a Falafel Burger. There are healthier options, like their Cup o' Crispy Green Beans, Burnt Broccoli and Spring Veggies with hummus. E's is open until 2 a.m. Thursday through Saturday. 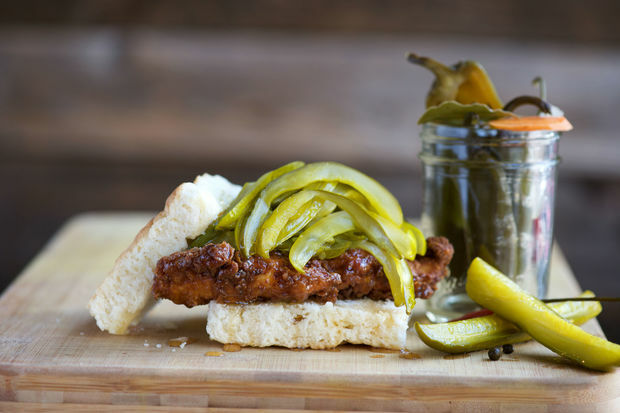 On Friday and Saturday nights, Jacob's Pickles serves up its popular Southern-inspired comfort food menu until 2 a.m. The Chicken and Pancakes entree with buttermilk fried chicken, crispy nitrate-free bacon and homemade syrup offers the perfect mix of savory and sweet flavors for those hours between nighttime and early morning. Or you can indulge in more drinks — cocktails or specialty beers — and take a bag of house-made biscuits home with you. This relatively new, cocktail-focused bar keeps its food menu simple, with seven options and four of them being different burger combinations. There's also a sloppy joe, a ham-egg-and-cheese dish and a chicken quesadilla, all for between $10 and $14. It's hard to find a more old-school pizza spot in the neighborhood. This roomy joint has plenty of booths to camp out in whether you're with a group or alone. Famous Original Ray's is open until 4 a.m. Friday and Saturday and until 2 a.m. every other day. Did we miss a spot? Let us know on Neighborhood Square.